Let's add exbe02 to the node. Add "ExchangeQuorum" to SCSI 0 Id 0, and "ExchangeData" disk to SCISI 1 ID 0. 1. turn on the exbe02. 2. Login to the exbe02. Install MSDTC on the exbe02. 6. Analyzing configuration will start. 10. On the next screen, it should give you a yellow ! mark, if you see it more closely, it would give you"Status 0x00138f: The cluster resource could not found" warning. That is because exbe01 is holding/controllong all the resources including Q: and X:. that is ok. This is what you should see on the cluster administrator screen. make sure you have exbe01 and exbe02. 5. Select "Disk Q:" and "cluster Name" from the "Available resources" box and move that to "Resource dependencies" by clicking the "Add" button. 6. Right click the "MSDTC" and bring online. 1. 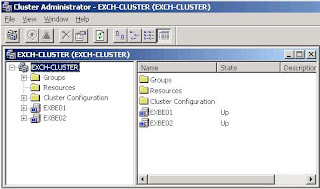 On the "cluster administrator" screen expand the "Groups". 5. Owner of "Cluster IP address", "cluster name" and "Disk Q" should be exbe02. 6. If the cluster does not move, check if MSDTC is intalled on both servers, and check if "ExchangeQuorum" and "ExchangeData" disks are attached to both servers. 1. Right click the "Local area connection 2" from the "Cluster administrator" screen. It is under the "Cluster configuration" -> "Networks"
3. Select "Internal cluster communications only (Private network)"
5. If you see Local Area connection's properties it should say "All communications (mixed network)", leave it like that. Now you have completed the first step to make exchange cluster.